This exceptional, antique George IV sterling silver bowl has a circular compressed pumkpin shaped form onto a circular shaped spreading foot. The surface of the panelled body is embellished with a contemporary bright cut engraved coat of arms and scrolling leaf mantling, below a crest of a bull's head erased. The shaped rim to the body and foot of this impressive bowl are encompassed with paralleling plain applied decorated borders. 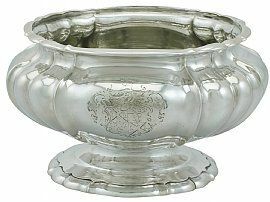 This impressive sterling silver bowl was crafted by the very collectable and important London silversmith Paul Storr. * There are several gentry families of the name Nun/Nunn who bear similar arms as depicted in the first quarter, together with the bull's head crest; notably the family of Nunn, of St Margaret's in the County of Wexford, together with another Nunn family, of Hill Castle in the same county. There are also several Nunn families in the eastern counties of England, Essex, Suffolk and Norfolk who have borne the same arms and crest. Read this items heraldic identification report. Full hallmarks struck to the underside of the bowl are all very clear. Reflections in photographs may detract from the true representation of this piece of Paul Storr silver.